Galaxy clusters are massive congregations of galaxies that host huge reservoirs of hot gas, the temperatures are so high that X-rays are produced. These structures are useful to astronomers because their construction is believed to be influenced by the Universe’s notoriously strange components, dark matter and dark energy. By studying their properties at different stages in the history of the Universe, galaxy clusters can shed light on the Universe’s poorly understood dark side. The team, consisting of over 100 astronomers from around the world, started a hunt for the cosmic monsters in 2011. Although the high-energy X-ray radiation that reveals their location is absorbed by the Earth’s atmosphere, it can be detected by X-ray observatories in space. Thus, they combined an ESA XMM-Newton survey, the largest time allocation ever granted for this orbiting telescope, with observations from ESO and other observatories. The result is a huge and growing collection of data across the electromagnetic spectrum, collectively called the XXL survey. “The main goal of the XXL survey is to provide a well-defined sample of some 500 galaxy clusters out to a distance when the Universe was half its current age,” explains XXL principal investigator Marguerite Pierre of CEA, Saclay, France. The XMM-Newton telescope imaged two patches of sky, each one hundred times the area of the full Moon, in an attempt to discover a huge number of previously unknown galaxy clusters. The XXL survey team have now released their findings in a series of papers using the 100 brightest clusters discovered. Observations from the EFOSC2 instrument installed on the New Technology Telescope (NTT), along with the FORS instrument attached to ESO’s Very Large Telescope (VLT), also were used to carefully analyse the light coming from galaxies within these galaxy clusters. Crucially, this allowed the team to measure the precise distances to the galaxy clusters, providing the three-dimensional view of the cosmos required to perform precise measurements of dark matter and dark energy. The XXL survey is expected to produce many exciting and unexpected results, but even with one fifth of the final expected data, some surprising and important findings have already appeared. One paper reports the discovery of five new superclusters, clusters of galaxy clusters , adding to those already known, such as our own, the Laniakea Supercluster. 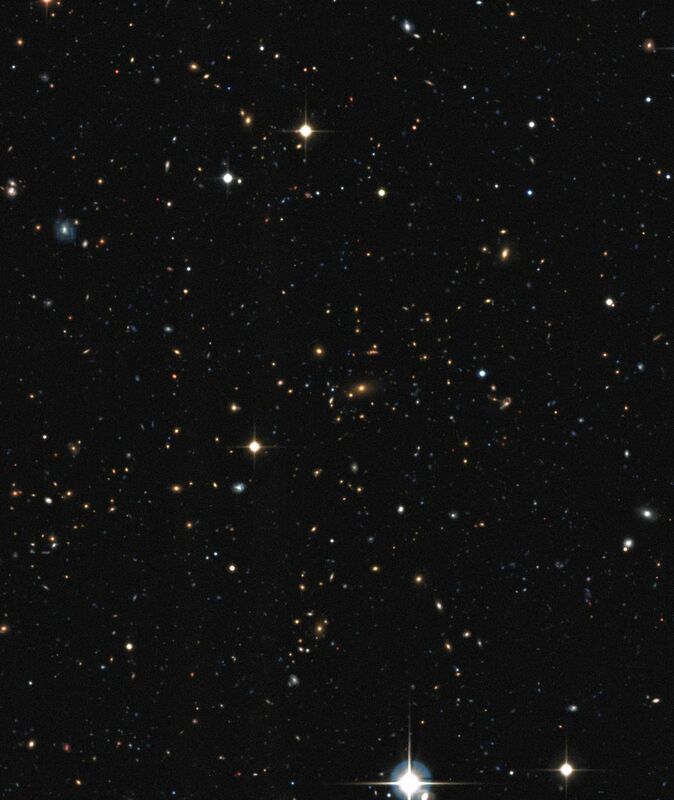 Another reports followup observations of one particular galaxy cluster (informally known as XLSSC-116), located over six billion light-years away. In this cluster unusually bright diffuse light was observed using MUSE on the VLT. “This is the first time that we are able to study in detail the diffuse light in a distant galaxy cluster, illustrating the power of MUSE for such valuable studies,” explained co-author Christoph Adami of the Laboratoire d'Astrophysique, Marseille, France. The team have also used the data to confirm the idea that galaxy clusters in the past are scaled down versions of those we observe today, an important finding for the theoretical understanding of the evolution of clusters over the life of the Universe.